Eau Claire, Wisconsin Affordable Dentures offers several styles of full dentures, each with special features and advantages. It’s part of our mission to put transformation within reach. See below for more details, or call us at 715-502-2784 if you have a question about a particular style. 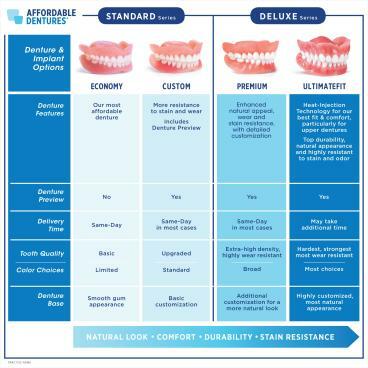 At Affordable Dentures®, our patients come first. We're dedicated to providing care for missing or damaged teeth to the community, and we do so at affordable rates so that everyone can have the opportunity to get the dentures they may need. Our independently-owned office is conveniently located in Eau Claire, WI, and we welcome the opportunity to show you why we're a leading practice in the region. Every day, we improve smiles, and more importantly, we improve lives. We'd be happy to go over your options so that you can have the smile you’ve always wanted. Patient education is an essential part of what we do, and we can answer any of your questions so that you can be more confident proceeding with a particular treatment plan. We hope to be able to meet your individual needs whether it involves providing you with a full set of dentures or addressing a specific issue. Our patients include residents from throughout Eau Claire, La Crosse, and the surrounding communities, and we look forward to the opportunity to work closely with you. We'll do what we can to give you ideal results, and in many instances, we can provide same-day dentures because of the on-site lab that we've set up. Call our office to schedule your appointment or discuss your situation with us. Your Dentist - Dr. Phillip R. Douglas Phillip R. Douglas, DDS cares about the well-being of each of his patients. He graduated from the Indiana University School of Dentistry, and he treats over 1,500 patients annually. He oversees all aspects of our work and leads the way in providing compassionate care to the people who seek out our services. Please fill out the form below to request an appointment. For immediate assistance, please call us at 715-502-2784.